Big C are passionate about training up the future generations of cancer researchers. We believe in moving forward in research and encouraging education and further study into the subject is vital. Met Aleks Gontarczyk. He’s in the final stages of his Big C funded PhD into cancer research – writing his thesis. We met up to chat about his experience so far and find out what the future holds. Big C allowed me to do a PhD, which has been invaluable on my path as a scientific researcher. After completing an undergraduate degree in genetics at the University of Sheffield, Aleks went on to do a masters in molecular medicine where he focussed on oncology before volunteering for a year at the Stephen Robinson Lab at the University of East Anglia (UEA). He later went on to secure a PhD which was funded by Big C to continue to work in that lab, under Research Group Leader at the Quadram Institute Bioscience and Senior Lecturer at the UEA’s School of Biological Sciences, Dr Stephen Robinson. Aleks’ PhD project focussed on angiogenesis – the formation of new blood cells. Aleks explains: “Angiogenesis is a really good process to target in therapy against cancer because it’s necessary for tumours to expand beyond microscopic size. “There’s a specific gene within the process of angiogenesis and years ago it was discovered that within a tumour that molecule is really upregulated and it’s a reason tumours grow so fast. “This became a hot topic in cancer research about 20 years ago, and a drug to target the molecule and stop the angiogenesis process was invented, with the hope that it would halt tumour growth. On a cellular and microscopic level, Aleks’ PhD project was trying to figure out and understand why this drug only worked initially and failed as a cancer treatment. He also hoped his work would highlight some new avenues for improving this approach. He has finished his experiments and says: “Within my thesis I’m proposing that I’ve found key things that are important in figuring out why the drug didn’t work. There are other genes involved we didn’t previously know about and I think we should consider these new candidates for a potential dual targeting strategy that may work. “I came across another drug that already exists that could be combined with the one that previously failed and that may have an impact. Like Aleks, PhD students are often involved in the early-stage projects which lay the scientific foundations for the large-scale clinical trials and real change in the future. Dr Stephen Robinson, who supervised Aleks PhD says: “PhD students are the life-blood of the lab. They bring unbridled enthusiasm, boundless energy, and new ideas to the lab. Without them, very little would get done. 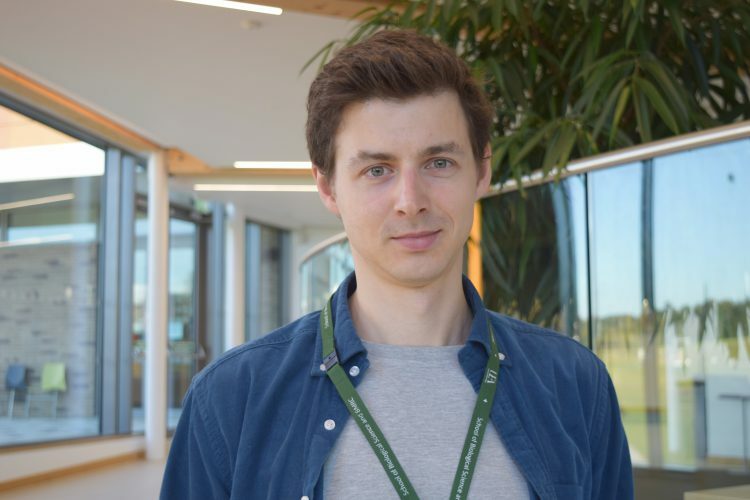 Going forward, Aleks has been offered a job as a post-doctoral researcher alongside Dr Stephen and will continue working on angiogenesis as well as being part of the upcoming project with Lindsay Hall at the Quadram Institute on microbiota in the gut, which you can read about in our first blog of the Science Series. Aleks says: “Academic research tends to be freer in terms of pursuing unexplored ideas, compared to the research that goes on in, say in the pharmaceutical industry, and I get to be part of that. “These ideas are usually more interesting, perhaps more risky in terms of success rate, but we need to think outside of the box if we are to find better treatments. Aleks has also spent time volunteering at Big C events by bringing along cells and a microscope and sharing his scientific knowledge about cancer with our supporters and community. He says: “Helping out at Big C events has been my way of showing that I’m grateful for the funding I’ve received. It’s always fun and the people I’ve met have been curious and want to understand what cancer research goes on in Norwich and further afield.